Sun Conures are among the most popular pet bird species and have been for many years. There are several reasons for this, not limited to the fact that they are arguably the most vividly colored and beautiful Sun Conure species. While most people are initially attracted to Sun Conures for their stunning looks, those who fall in love with the species do so due to its many other endearing characteristics. 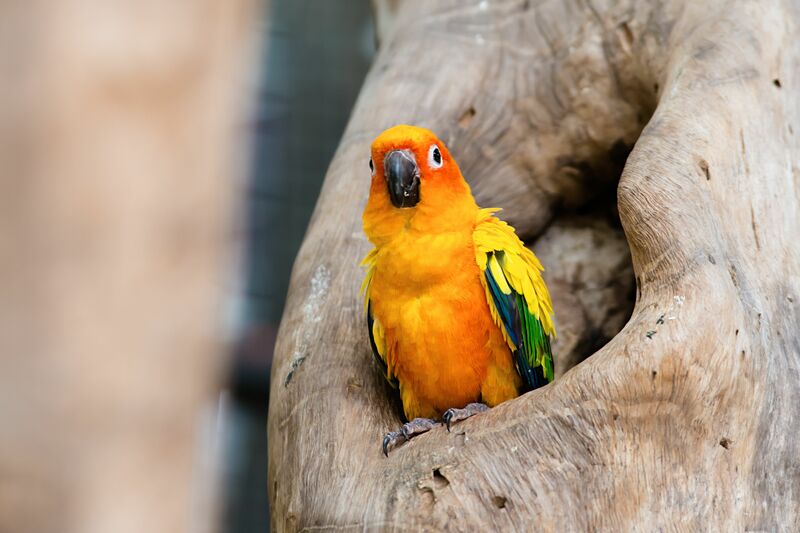 Take a look at some of the facts listed below to learn more about Sun Conures and what it's like to keep them as pets. Coming in at around 12 inches in length from the beak to the end of the tailfeathers, the Sun Conure is a ​medium-sized bird with a nicely proportioned figure, healthy birds being neither slim nor stout in profile. They have a classic parrot look to them without the size and bulk of larger birds like Macaws or Cockatoos, making them very appealing to those who are drawn to the look of more exotic bird species but don't have the room to house and care for a very large bird. One thing that potential Sun Conure owners should realize is that these birds are extremely loud, and are not a good choice for those who live in apartments. They possess an ear piercing scream that they will emit throughout the day, more notably at sunrise and sunset. Their contact call can carry for miles and helps them locate each other in the wild while out foraging for food during the day. In captivity, however, this level of noise can cause problems for those who live in close proximity to their neighbors. Adopting a Sun Conure is no small commitment -- with proper care, these birds can have a lifespan of up to 30 years in captivity. Before you decide to take the plunge and bring a Sun Conure home, make sure that you are willing and able to commit to caring for your bird for at least this amount of time. All too often, unprepared people adopt these sorts of birds and then decide that they aren't willing to care for them for as long as they will live, and this results in many homeless parrots. Don't let your bird become a statistic! While it's certainly not the case for all Sun Conures, some individual birds have learned to talk quite successfully, and have been able to amass a vocabulary of a few dozen words. In general, though, it's not reasonable to expect a Sun Conure to develop the talking prowess of other types of parrots like Amazons and Macaws. More often than not, Sun Conures tend to prefer to mimic other types of sounds, such as whistles, microwaves, doorbells, and telephones. Some Sun Conures never mimic any sounds at all and prefer to stick to the normal range of vocalizations for their species. While their colors are somewhat similar to the equally popular Jenday Conure when they are juveniles, Sun Conures are widely regarded as the most colorful of all the Conure species. This is because a mature Sun Conure sports plumage in a variety of shades of red, yellow, green, orange, blue, and in some birds, tones of violet. Another distinctive feature of the Sun Conure is the bare white patches of skin around the eyes, known as "eye rings." These patches are similar to the bare patches commonly noted in Macaw species and are seen by many as an attractive feature for a parrot to have.